So my neighbor asked what I do for a living. I explained that I work for a software company on the product design team. His response? 1. I said, “product design” which isn’t even remotely close to what he’s asking for. 2. “Making a website” requires a killer website design, content strategy, great content, excellent UX , hosting, analytics and a plethora of other things. Judging by the way he said, “make me a website,” I think he was envisioning a mouse and magical fairy dust being involved. 3. I have a pretty sweet blog, but it’s hosted through WordPress with a pre-made theme applied because stick figures are the extent of my artistic prowess. 5. If I had said I was a goat farmer, would he have asked me to give him a goat? 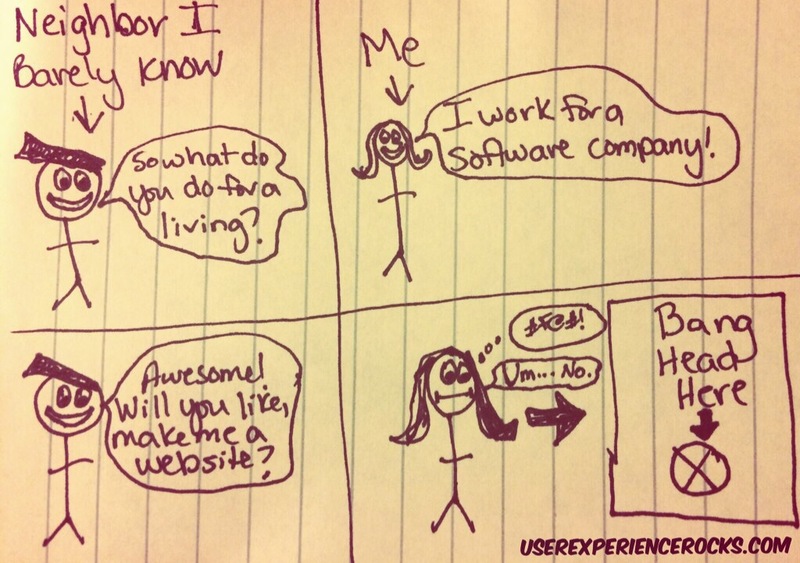 You’re a software designer? Awesome! Come fix my hardware!